Added support for CR2 raw files. Added option to choose another font (name and size) to display in the main ListView. Fixed bug: image with specific EXIF structure caused ExifDataView to hang or to crash. Fixed to display properly the values of GpsLatitude and GpsLongitude. After running ExifDataView.exe, you can open a .jpg file by using the 'Open File' option (Ctrl+O) or by dragging the .jpg file from Explorer into the main window of ExifDataView. 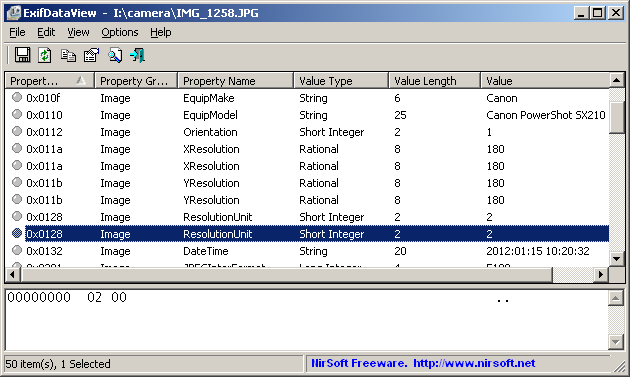 After opening the .jpg file, the list of all Exif properties are displayed in the upper pane of ExifDataView. When selecting a single Exif property on the upper pane, the lower pane displays the content of the selected property as Hex Dump. /LoadFile <Jpeg Filename> Load the specified .jpg file into ExifDataView. /stext <Filename> Save the Exif properties list into a regular text file. /stab <Filename> Save the Exif properties list into a tab-delimited text file. /scomma <Filename> Save the Exif properties list into a comma-delimited text file (csv). /stabular <Filename> Save the Exif properties list into a tabular text file. /shtml <Filename> Save the Exif properties list into HTML file (Horizontal). /sverhtml <Filename> Save the Exif properties list into HTML file (Vertical). /sxml <Filename> Save the Exif properties list into XML file. A file named ExifDataView_lng.ini will be created in the folder of ExifDataView utility. After you finish the translation, Run ExifDataView, and all translated strings will be loaded from the language file. If you want to run ExifDataView without the translation, simply rename the language file, or move it to another folder. ExifDataView is also available in other languages. In order to change the language of ExifDataView, download the appropriate language zip file, extract the 'exifdataview_lng.ini', and put it in the same folder that you Installed ExifDataView utility.